Stefanie entered Cole and Lacey in the GAP casting call! (Christie, when are you entering Kennedy?!) And because I obviously have the most adorable nephew and nieces in the world, I'm asking you guys to vote for them!! Click on this link here and vote for them! You can vote once every day...so make sure you put it in your favorite and come back to vote!! You can vote through November 17th so get moving!!! Feeling festive? Click here to read Kelly's (from Kelly's Korner) take on being a Christian and a pumpkin! I just love it! me: where did baby Cole go?! me: ok, you wanna go grab a different book? me: we just finished that book silly! Go grab another one from your room! Cole: (as he's giving me the puppy dog eyes) Auntie do it! me: you want ME to go get a new book?! me: you want me to come play outside? Cole (as soon as Stefanie shuts the door, he pushes me and says): Auntie, inside. me: You want me to go inside? me: well, are you going inside? Cole: No. Cole play outside. me: I can't go inside unless you go inside! Do you want to stay outside? me: how was the college? me: did you see another college? padre: what do you mean? me: well...did you just visit Ripon or did you see another college too? me: how did you get into Lambeau anyways? Do they just let people visit? me: you realize this is all going to be a part of Padre Ramblings right? padre: and they even played music just like they do for the packers! me: you really do live in your own little world don't you?? I know, I know. I've been awful right? Well, I figure now that I've got a couple of people on my case about getting back to blogging, I better do it. And what better way to get back into it than to announce the arrival of my new niece!!! 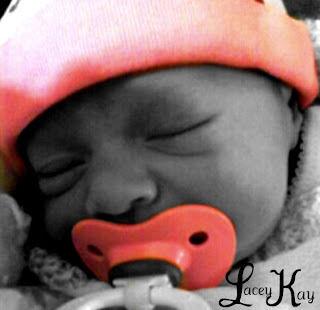 Lacey Kay Straka was born on September 30 (woohoo! another September birthday, finally!!!) at 9:23 a.m. Stef had a fairly quick labor (and by "fairly quick", I mean...thank goodness she was at the hospital when her water broke because she had Lacey 10 minutes later...) She was 6 pounds 15 ounces of perfection! I'm not sure how my sister gets so lucky but she has been blessed with another fantastic sleeper! Lacey has slept from 11pm-4/5ish in the morning EVERY night except once! And then she eats and goes right back to sleep...amazing! Alright, well I'm gonna let this be a quick post (but picture heavy...because...come on, I have to show off Lacey!) and I PROMISE I will be back much sooner than last time!